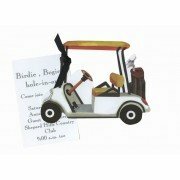 This invitation in shape of golf cart is perfect to use for retirement parties, birthdays,&n.. 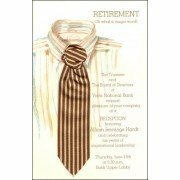 Size: 5.75" x 8.75" Includes: Invitations, Envelopes and Ribbon P.. 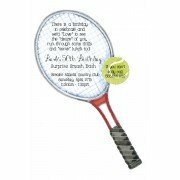 This fabulous invitation in shape of shoe is sure to be a hit at any event. Your party informatio.. Envelopes included. Size: 6.25" x 9.25" .. 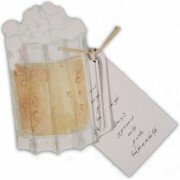 Size: 5.75" x 8.75" Includes: Invitations and Envelopes Processing Time: If orderin..
Stay up all night with this playful party invitation! 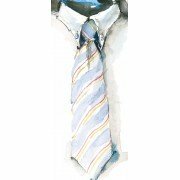 This stylish design is printed on luxurious.. 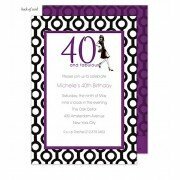 Celebrate 40 in style with this fabulous party invitation! This stylish design is expertly printe.. 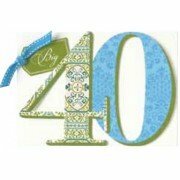 This two piece 5" x 7" invitation features a die-cut of the number 40. Your party infor.. 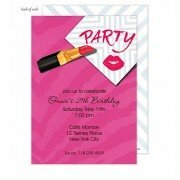 This 9" x 3.25" two piece invitation features a flocked die cut of the word "party..